A couple of weeks ago, I posted about how fiancé and I put up a clothesline. My idea was that it would save us money on our electric bill. Right now I’m having to get used to only doing one load at a time. I’ve been used to getting all my laundry done in a day. Don’t have the space for that goal YET! Maybe one day. We received our next electric bill. Unfortunately, we did not save anything. However, this can be attributed to that fact the weather dropped to the 40s and we had to turn the heater on 4 days in a row. Never again! I’ll pile all the blankets we have on the bed instead of turning the heater on. Now onto Month 2 with clothesline! Hopefully the weather will cooperate in more that one way (no rain, not cold) and I’ll be able to report success next time. When fiance and I moved into an apartment, one of the things we asked about was putting up a clothesline. I was looking at it from a money-saving perspective. Fiance grew up with a clothesline so he had no problem with it. We were told that we couldn’t attach anything to the building structure or anything in anyway fly off the balcony. We ended up copying another tenant’s idea that seemed to be within the parameters. We hooked paracord around one railing and strung it across the 12 foot space and back again at an angle to create a V-shape. It’s hooked at both ends so we can take it down when needed, AND there’s not damage to the railings! We set it up yesterday (3/3/2013) and put the first load out. It happened to be a really windy day. I was worried that the wind would pick up too much and I’d watch helplessly as the clothes flew away. Before bed, we brought everything in. 60% of was dry and ready to be put away, the rest was hung up on hangers and put in the spare bathroom. I didn’t want to leave it outside overnight, mainly because of my fear of stuff flying away. 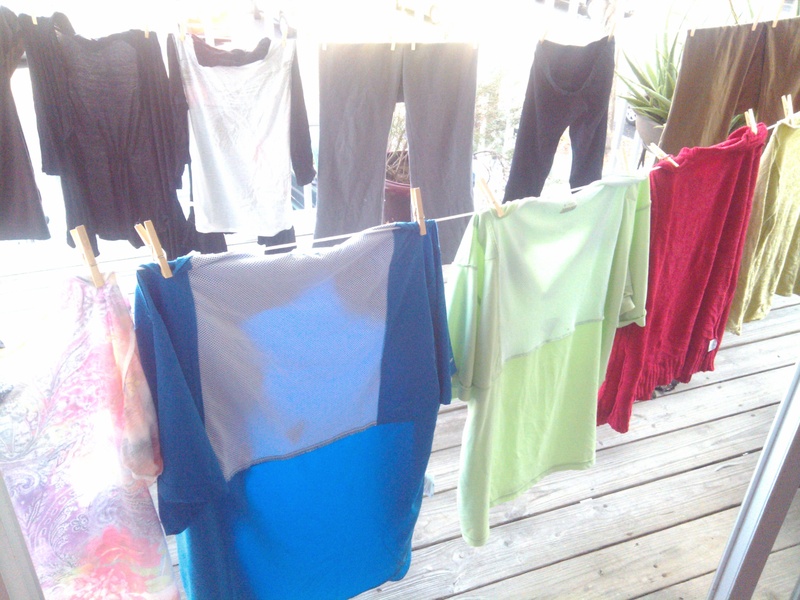 Our goal is to completely line dry our laundry this month to see how it affects our power bill. No pictures yet, but I’ll get one to add it.